SPMI - The Project Management Institute Singapore Chapter which is the Country Chapter of Project Management Institute (PMI), established in the year 1999. SPMI currently has over 1900+ active members and is so glad to inform the results for the prestigious 4th Project of the Year (POY) award, which had attracted Corporates and Government agencies. The POY 2017-18 Awards Gala Dinner clubbed with SPMI Member’s Nite was conducted at The Fullerton Hotel on 3rd Apr 2018. Nearly 300 project professionals across various Industries from 180+ companies participated in the 4th POY Award Ceremony. SPMI was honoured to have Ms. Indranee Rajah, Senior Minister of State for Law and Finance, Republic of Singapore, as our distinguished Guest of Honour (GOH) to this award event, and shared in her key note speech, the below points: (for more details click here) for speech link from Ministry of Law, Singapore web-page. Before start of the POY 2017-18 awards, GOH had a dialogue session on ‘Importance of project management in the Engineering Services sector’ along with Senior leadership team from large engineering companies such as Jacobs, Samsung CT, M+W group, together with Singapore Government Agencies Land Transport Authority (LTA), Housing Development Board (HDB) and SPMI leaders. SPMI president Mr. Umesh Ursekar had inaugurated this award ceremony, shared the importance of Project of the Year award, for recognizing project management excellence in Singapore arena. The 4rd POY 2017-18 Awards Chairman Mr. Hari Hara, presented the Overview of the POY 2017-18 award Journey, highlighted the insights of the award categories, where Project Management is largely practiced across various industries. This year, POY awards attracted nominations from various industrial segments Viz., Information Technology, Banking, Pharmaceutical Healthcare, large EPC companies, Government agencies LTA (Land Transport Authority) & IPOS (Intellectual Property Office of Singapore), International consultancies, Energy & Chemicals, Rail Transportation infrastructure. The POY Award program was conceptualized and delivered, by SPMI board member Mr. Rashid Mohiuddin for the first two years of POY awards and also SPMI’s Mr. Rama Prasad Mamidi is part of POY Committee. On behalf of SPMI, Mr. Umesh Ursekar PMI Singapore Chapter President presented a “Leadership Impact Award”, to Ms. Fong Pin Feng, Director Economic Development Board of Singapore as a recognition for her leadership role in building partnership between EDB-SPMI over several years. 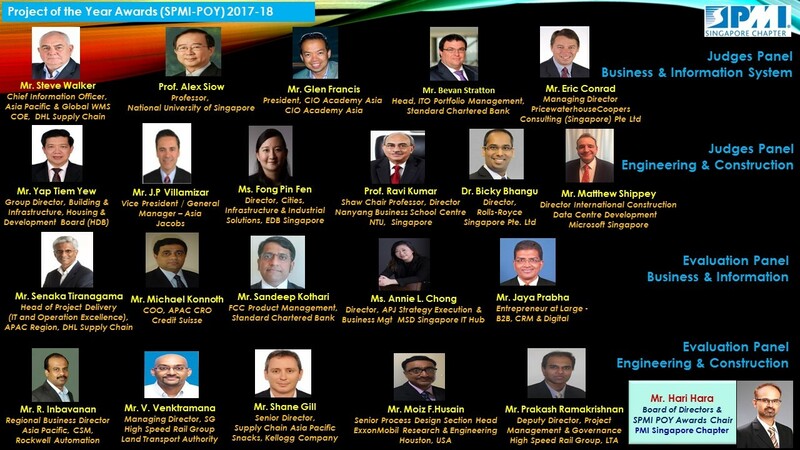 Mr. Hari Hara, was honored with a Special Recognition Award by PMI Singapore Chapter President Mr. Umesh Ursekar, for his exemplary leadership and commitment as Chairman of Project of the Year 2017-18 Award program and also token of appreciation was given to all the below mentioned Evaluation & Judges Panel members, POY Co-Chair Ms. Maha and POY committee members. 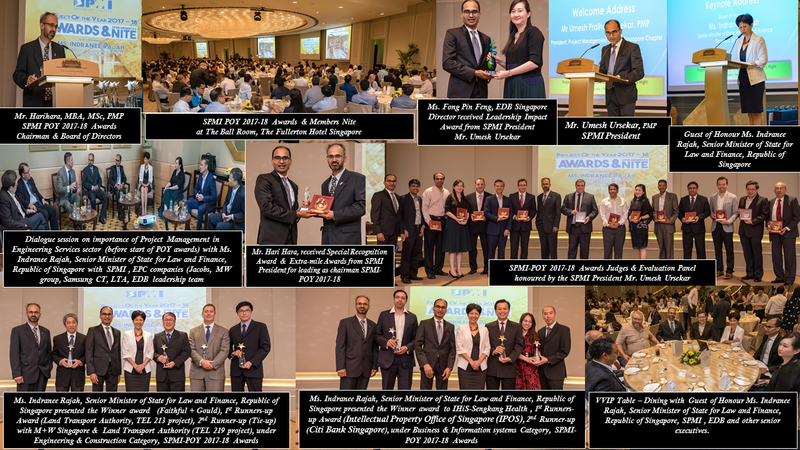 SPMI-POY-2017-18 award program was backed-up with a strong line-up of 21 Judges and Evaluation Panel members which includes CIOs, Professors, Senior Vice Presidents, Corporate Directors, EDB director, and many other senior executives from the corporate world and reputed institutions (NTU & NUS). SPMI thanked all nominated companies also with an appreciation plaque at end. Watch out for the launch date for next SPMI POY 2018-19 Awards!! which shall be announced soon by SPMI POY committee. SPMI request all PM professionals across various industries /government agencies to use this platform to get recognized for their project delivery excellence. SPMI expects more Corporate & Singapore Government Agencies Nominations, where submissions are absolutely Free of Charge. Refer the adjacent chart for all nomination companies & government agencies participated in last 4 years of POY 2014-2018 Awards program. SPMI once again thanks all participated companies, Judges & Evaluation Panel, Sponsors for making Project of the year 2017-18 Awards yet an another outstanding, successful program. We look forward to your continuous support. About the Author: Mr. Hari Hara Subramanian, MBA, MSc, PMP®, is an experienced (18yrs+) Project Management Professional in the EPC business with keen interest on project delivery, organizational growth strategy and business enhancement. He is an active member of SPMI since year 2008 and serving as SPMI-Board of Directors since 2015 on a PMI Volunteer role. He holds a MBA from Rutgers Business school, USA, a Master of Science (CIM) degree from NTU, Singapore and a Bachelor of Technology in Chemical engineering. Currently he is working as a Project Manager in a leading global engineering design, construction, consulting firm at Jacobs. 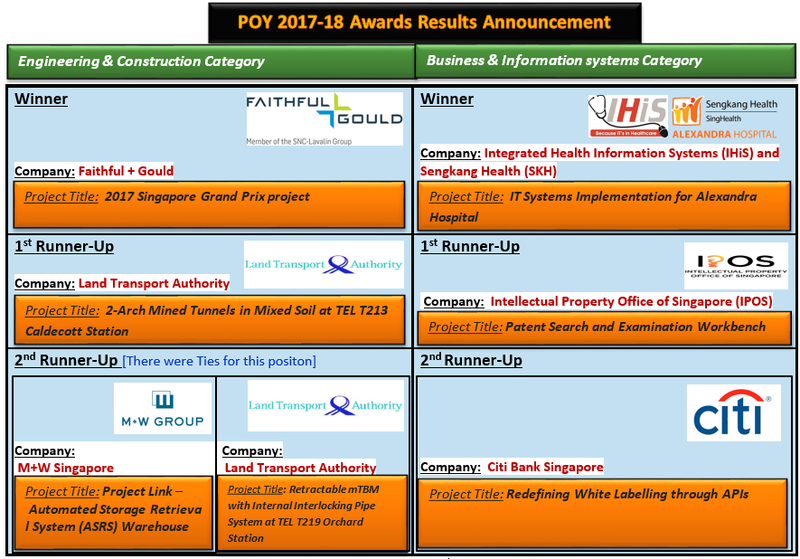 For any query related to this newsletter or POY awards program, please contact via Email: hariiyer10@pmi.org.sg or via LinkedIn.